Eggs — a great staple of any diet. In the recipes below choose real, grass fed butter as a healthy choice, and if you can find fresh eggs from the farmer’s market, or pasture-raised eggs from your favorite grocery store, you’re golden! 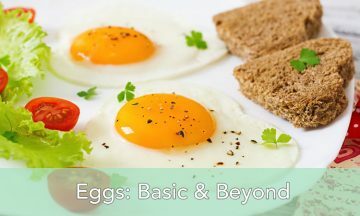 Poached eggs are a delicious addition to a slice of whole grain toast or an English muffin and are one of the healthiest ways to prepare eggs since they don’t require oil or butter like some cooking methods do. Poached eggs can be a little intimidating to make, but are quite easy once you learn a few little tricks. Our favorite poached egg tip: add a splash of white vinegar to your simmering water before you add the egg to help hold the white together better. This Youtube video shows how to make the perfect poached egg! An omelet is a great choice for breakfast. Add your choice of vegetables, cheese, or meat, and you have a nutritious and filling start to your day. My favorite omelet tip: make sure the eggs are at room temp before starting – this will help avoid overcooking. This classic favorite to preparing eggs is a great place to start if you have never cooked eggs before. Simply crack the eggs in a bowl and stir with a whisk or a fork, add some salt, pepper to taste, and pour into a hot skillet. Then, use a spatula to move the eggs around slightly until they are cooked to your liking. Healthy Tip: Use stainless steel rather than non-stick as we’re still not sure about how the toxins in the non-stick coating may affect us. To keep your eggs from sticking use a little butter or oil. Don’t let the word “fried” turn you off–we’re not talking deep-fried here. You may want to pull out the nonstick pan for this one. * Heat the pan with some good, grassfed butter. Once butter is melted, add a little salt and pepper to the pan and pour the room temp egg gently from a ramekin or small bowl to make sure you get it right where you want it. Once it has cooked enough to slide around in the pan, gently flip it over for a few more seconds to make sure all the whites are cooked. This won’t take long! Serve over toast and enjoy! Here’s a recipe that includes avocados you might enjoy. Boiled eggs have a great versatility factor to them. Like poached eggs, you are only using water (or you can bake them in the oven for the same affect), adding no extra fat to them while they are cooking. Boiled eggs are great just eaten by themselves or made into an egg salad, or a boiled egg sandwich with a little mayo and a fresh sliced tomato on whole grain bread. A party classic, devlied eggs have come a long way. The classic version of egg yolks mixed with mayo and pickle relish may not be the healthiest, but if you sub non-fat Greek yogurt for the mayo, you’ve just upped the game. Here’s a tip: go light on the yogurt – you can always add a little more if needed. If you are looking to cut back on your fat, egg whites are also a great option. We love them scrambled, or on a sandwich with some turkey. They are also great in an omelet with your favorite veggies. Frittata’s are delicious and great to make ahead of when you will need them. They are similar to quiches but do not have any cream or crust, so they are slightly lower in calories, but equally as versatile and delicious. We love using an iron skillet in my cooking when we get the chance, and frittatas give you that chance! As mentioned above, there are concerns that non-stick pans might be dangerous. If you prefer nonstick for the convenience, just take care not to over-heat the pan – avoid the “high” setting as temps can reach 500°F in two minutes. Also, use only utensils made for non-stick pans. Finally, if a pan is scratched, or flaking, throw it out.